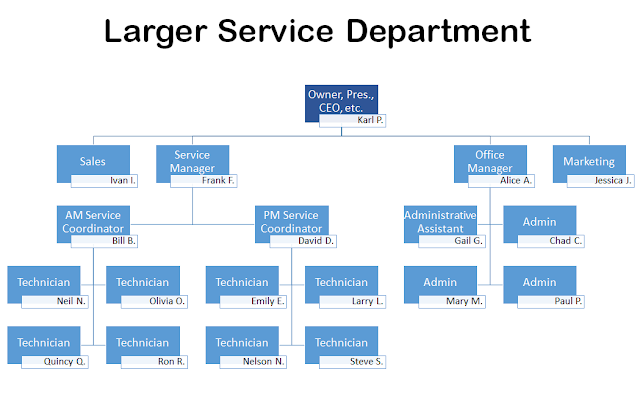 I received an email from Otto with an interesting question: What is the ideal organizational chart for a managed service provider? This is an great question because it gets to the more important question of how you grow your company. It also brings up additional questions like when to hire a service manager, when to hire a sales person, and how many administrative support staff you should have. Of course all the names except mine are changed. Obviously that's different from when we started. For the most part, most companies start out with one or two people. Eventually you need to hire additional staff. I recommend that your first hire should be an administrative assistant. That frees up the owner to spend a lot more time doing sales and tech support. Your org chart will evolve over time. Here are some basic stages. Believe it or not, I think it's useful to create this chart even when you are doing everything. It helps you define the roles you play. It can also help you balance your time and think about whether you're spending enough time in each of these roles. We all know we need to do sales. But if you don't like it, you might not do it (for example). Eventually you will add a technician. That will give the owner more time to do more sales. So you'll add more techs. But remember that you should also add more administrative assistants. In my experience, it's easy to find lots of extremely talented administrative assistants who want to work 20 hours per week. A LOT of what we do can be done by a well trained admin with a good checklist. This is particularly true in the era of cloud services. There is no technical skill required to set up users in your PSA, QuickBooks, or even the RMM tool. As a rule, I would have technicians handle the RMM and admins handle the PSA and QuickBooks. Admins can also set up all the accounts for hosted Exchange, spam filtering, anti-virus, Office 365, hosted storage, etc. 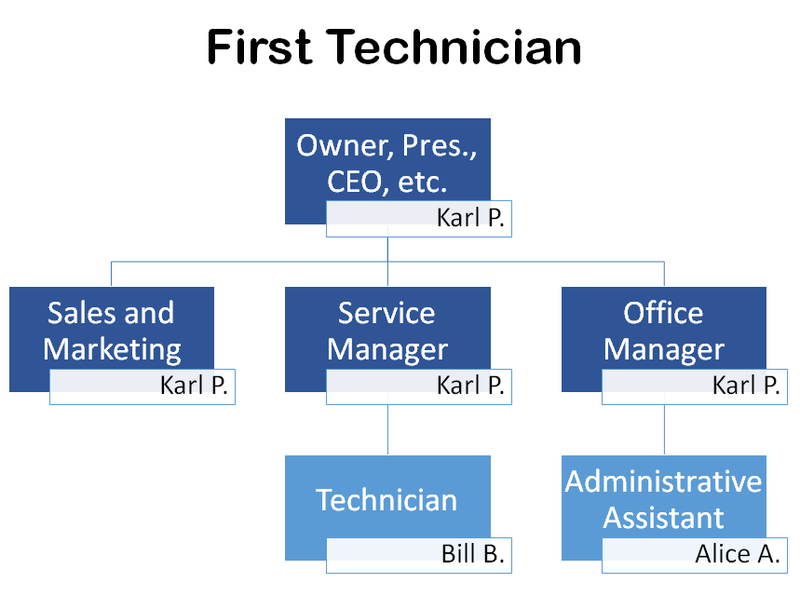 I would leave the BDR configuration to technicians. But setting up usernames and passwords in the other services does not require technical skill. Eventually, your principal AA will become your Office Manager. This relieves even more burden from the owner because now you've got someone to manage the admins as well as pieces of the client relationship. The financial piece is a big part of that. Life gets very good when your office manager handles all the billing, all the deposits, and both hiring and managing administrative assistants. A similar evolution takes place over in the Tech Support department. Eventually, one of the techs evolves to be the Service Manager. While the owner will probably want to be involved in hiring for a long time, the Service Manager will eventually take on primary responsibility for that. He'll also manage technician time, coordinate all tech support, and play a huge role in managing client relationships. At this point, the owner has two direct reports: The Office Manager and the Service Manager. You can grow quite a bit from there. Most good managers can effectively manage five to seven people. And please note: it doesn't matter whether they're full time or part time: people are people. So they have time cards, family issues, insurance paperwork, vacations, and interpersonal issues. Five to seven direct reports take about the same "management" whether they work 20 hours or 40 hours. The only other "department" you might not have for quite some time is Sales and Marketing. Please remember that those are two different functions, especially from the employer's perspective. You employ marketing people to get the word out so prospect will call you and engage in a sales process. Marketing people always cost money (the same as administrative and technical personnel). In the evolution of your company, you will probably have marketing campaigns executed by the admin department for a long time. In fact, you may never have a sales or marketing department. You may just have a marketing assistant managed by the owner or co-managed by the owner and the office manager. Sales people are a different story. They should cost you a little until they bring in a lot of money. Eventually, they will cost you a lot because they're bringing in a lot more. Paying sales people is a different discussion. But let's assume you pay about 10% of gross sales or 30% of profit. These are probably very similar numbers. When you realize that your sales person has to sell about $750,000 in new business each year to bring home a nice $75,000 income, you can see that VERY FEW people are able to do that. As a result, I highly recommend that you put off hiring a sales person for as long as you can. The owner will always be a better sales person for your company. If you have high-end services, then you may be able to hire a sales person much sooner. But you need to make sure that you want to be a sales organization. Having a dedicated sales person who can bring in that kind of money means that the rest of your organization is ready to grow at that rate every year. 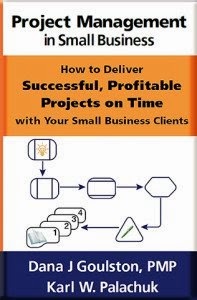 If you can't deliver premium service with a growth rate of $750,000 per year, then you will end up losing a percentage of you clients every year. Think about where that leaves you: You're paying a sales person to replace lost clientele every year because you over-sold and under-delivered in the previous year. So you're not really growing at the 750 rate. Instead, you're paying commissions to replace unhappy clients. In the meantime, your service department is growing and you may now have more than the ten technicians that a service manager can handle. 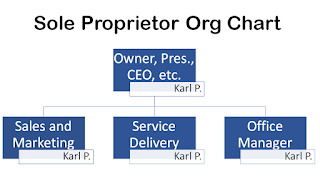 If you DO commit to a sales person, just remember that it will permanently affect your org chart and the structure of your company. You will probably not have ten administrative assistants for a long time. But you will have a growing service delivery department. The next evolution of the service department is to hire a second-in-command. 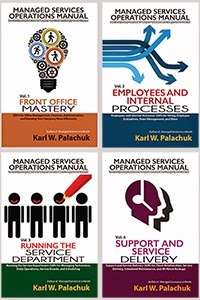 Rather than having two service managers, one way to go is to have morning and evening service coordinators or assistant managers. First, you might hire an evening Assistant manager who comes to work at 10Am and works til 7PM. He will manage the late-shift techs and the Service manager will come in at 6AM and manage the early-shift techs. This extends your service hours if you wish. It also allows you to take care of a lot of the work that requires system reboots outside of client office hours. You can get a lot of work done before and after client work hours! First, the owner should take on all the duties that he "has to" do, whether he wants to or not. That includes sales, finances, marketing, etc. Second, the owner should hand off the easiest and most time-consuming duties. You may have heard that you're the most expensive person in the office, no matter what you pay yourself. So hand off the less-valuable chores to someone making a lot less money! Third, hire "managers" primarily on their ability to manage. Do NOT put your best technician in the Service Manager role unless she just happens to be a great manager. Managing people is a skill. It can be learned. But some people just don't have the temperament. Bad managers can kill your company by destroying relationships inside and outside the company. 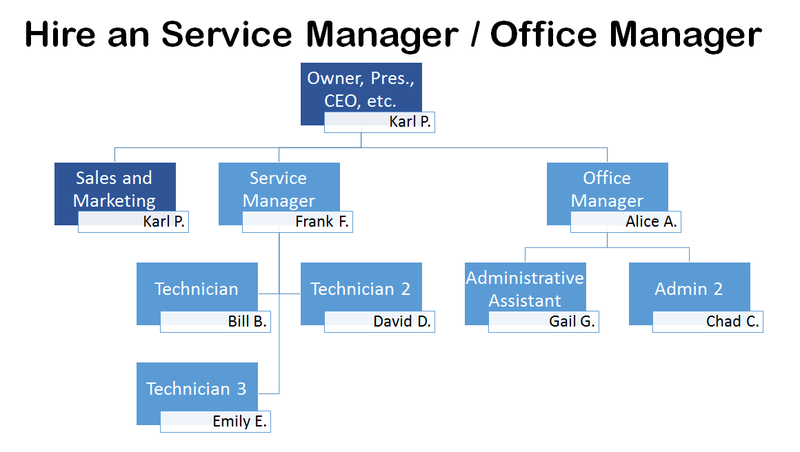 Fourth, revisit your org chart from time to time. Grow with intention and make sure you have the best people in each role. One of the advantages of having a larger company is that your employees will evolve and grow. If you can move them into better positions from time to time, they will stay longer. In addition to advancing their own career, they provide better service to your company. Fifth, do not let your company evolve based on the current collection of employees. Do not redraw the org chart to fit your personnel. People will leave. They'll grow up. They'll get married. They'll need more money than you can pay. They'll move to another state. They'll do all kinds of things that humans do. Someone might work for you for 25 years and retire from your company - but I doubt it! 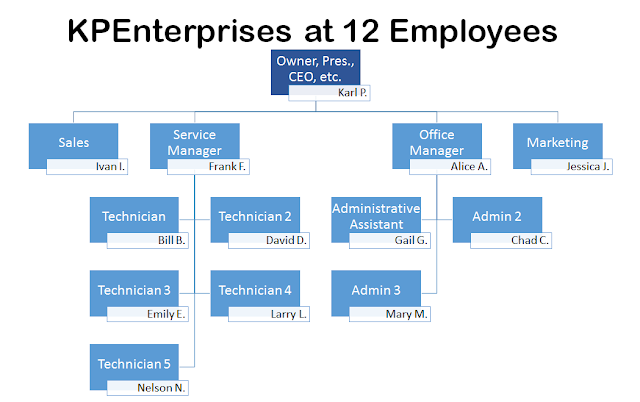 Draw your org chart and fill it with the people you have. Remember that the owner wears all the hats that no one else is wearing! Let the org chart evolve, and move people around as needed. 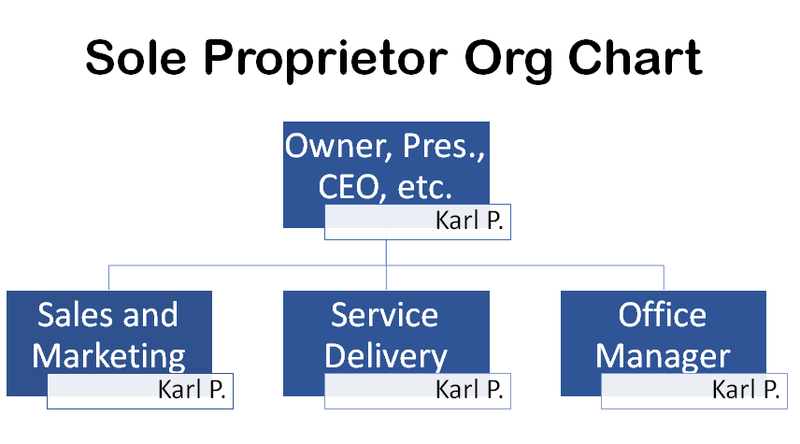 But, again, create your org chart with intention. And let it evolve with intention. Thank you Karl for your post about employees and growing a team. I'm finding them extremely useful; I'll be adding an admin assistant within the next couple weeks. Thanks again! Thanks, Donte. Best of luck with the new hire! Thanks Karl, that´s exactly what i exptected!